How can I not love a Kasie West book if she’s the queen of cute contemporary romances. I read Lucky in Love in one of those “sad days” and it amazed me how her books always make me feel better. Even though her main characters are starting to feel too similar for me (I know, I’m going to hell for saying this), Kasie West brings to life Seth, one of the cutest love interest I’ve seen. I loved Maddie and Seth’s relationship and how cute they were together and while I felt like Maddie was a little dramatic and sometimes even did not deserve Seth, I still loved how everything turned out to be. You see, this book is about money and money is almost always a hard topic, because not everyone feels the same. So, half of the book I was really angry with Maddie decisions, they felt too childish and self centered, and sometimes I kept thinking it was unrealistic, but I can’t know for sure, because it obviously never happened to me (you know, to be millionaire). The other half, I kept feeling bad for her and I just wanted her to be happy. While money stuff wasn’t my favorite part to read, the romance was EVERYTHING, I still haven’t found any other author that makes fall in love with a romance as much as Kasie West does. I want all her couples to live happily ever after. 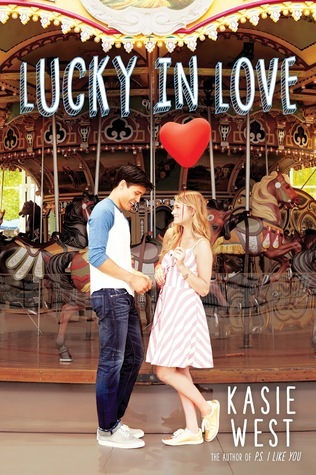 Overall, I enjoyed Lucky in Love, it didn’t disappoint at all, and now I can’t wait to read what’s next from her!